This past Sunday I was at the memorial service for a friend who has passed on. It was a lovely service because quite simply she was a lovely person. All four of her children took turns speaking and everything they said was beautiful, full of love and gratitude for having her as a mom. I had never met any of her children, all of whom are just a little bit older than me if not the same age, but none of what they said was at all illuminating. It was not illuminating because all the wonderful attributes of compassion and investment of time they described had been experienced by myself and pretty much every adult sharing the same pew, all of whom are young enough to be her child. When I think of Christ centered community I think of Tom and Jeanne Gould. When I was a college student at Spring Arbor University I served in the worship ministry of a local church as a vocalist and volunteer in the youth ministry. This church didn’t have a college or young adult ministry and yet I felt right at home as a young adult college student because families of students, other volunteers, and fellow worship team members showed an interest in me, and welcomed me into their homes. 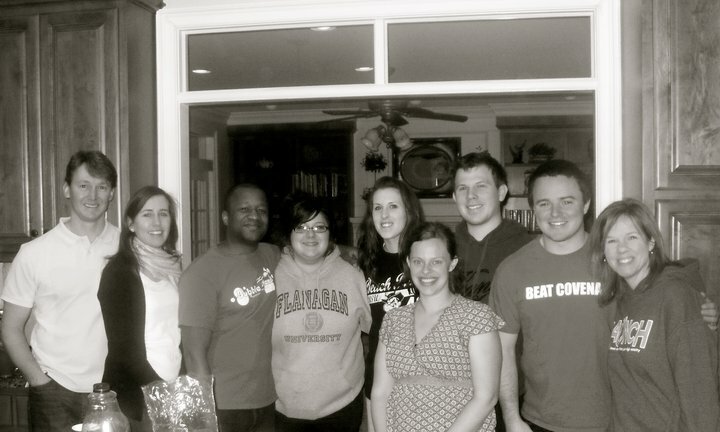 When I think of Christ-centered community I think of Andy, Trish, Janine, Taryn, and Scott. The first church I began going to without my parents started with getting involved with the youth ministry as a Senior in High School. They had a college ministry, but that’s not where I felt most at home. I felt most at home with Vaughn and Marilynn, so much so that most Sunday afternoon’s and evenings were spent in their home. A good number of Friday nights were spent hanging out with them as well as going to the movies and getting something to eat. Sure they had two kids my age, but our friendship deepened when their kids where away at college and I was still in town. When I think of Christ-centered community I think of the Lipperts. All of us are looking for community. Many leave churches because they can’t seem to find community. I’ve heard many people lament the absence of a college ministry, or young adult ministry, or a young married ministry, or you name it ministry. There isn’t a ministry where they can get easily plugged into and get community. Then there are others who find the ministry for them, their demographic, and still leave because real community evades them even within the group. Even though I wasn’t a student at the University of Michigan (I went to the local community college) I was looking for community and thus began attending Campus Crusade meetings with friends who were students. I never quite got plugged into that group even though there were some friends I made that I could hang out with probably because I wasn’t a student and though I lived in town I didn’t live on campus. Oddly enough the place where I did find community was also on the campus of University of Michigan, Athletes in Action, which was basically Campus Crusade for the athletes. Not only was I not a student at UofM, but I certainly was not a division I athlete. Yet just this weekend I connected with a friend that I know through AIA that was in town on business because we’ve been friends ever since we met thirteen years ago. When I was in Chicago two years ago on a Conference I was able to catch up with a friend who lives there for coffee that I met through AIA. I was invited to go on my first overseas mission trip with AIA in 2001. My reply was, “but I’m not even a student here much less an athlete.” The reply I received was assurance that despite those things I was definitely a part of that community. When I think of Christ-centered community I think of Donte, Robyn, and Bruce. The point I want to make with all of these stories and illustrations is this… If you want to find and be apart of Christ-centered community you have to be willing to go beyond affinity. If you’ve grown up in the church you’ve probably been conditioned to settle for affinity. From the time we are infants to when we are Seniors in High School our community in church is shaped around primarily being with people who are the same age and life-stage as our self. We unconsciously look for the people like us. It’s no wonder that most college students and young adults won’t even consider attending a church that doesn’t have a ministry for their age group and will eventually leave a church if they age out. Affinity is not bad it just has a way of robbing us of true community if we’re not intentional. It’s comforting to have “likeness” but we may find that something is missing without some diverseness and depth. Moreover, if we refuse to take a risk and invest relationally in someone else because they aren’t the same age or life-stage as us we could seriously miss out on some beautiful relationships. Even amongst those who are the same age and life-stage as us we often discover that there can be a disconnect because we haven’t discovered the deeper more significant and lasting affinities we have with people. And there is no deeper more significant affinity than having Christ in common. How else could I be friends with a raging Ohio State Buckeyes fan like Tom Gould? When I first came on staff at Church at Charlotte I tried to help breath some life back into the 20s-30s group. It worked for a little while before things fizzled out again but when I think of that group I think of the couple who were well past their 20s and 30s by about twenty to thirty years that invested in that community. Even after the group fizzled out Tom and Jeanne continued to invest in many of the disbanded members. Tom led a Bible study with many of the guys, and together they went out to eat with and hosted many of the women in their home. Therefore there was a whole pew of people with whom the words of Jeanne’s children at her memorial service resonated with because they experienced the same kind of relational investment.